How to Incubate Chicken or Duck Eggs from fertile, hatching egg. The information here is from the Western North Carolina Farm and Garden Calendar for USDA Zones 5, 6, and 7 for all eastern states. It is a 280 page book that I wrote. 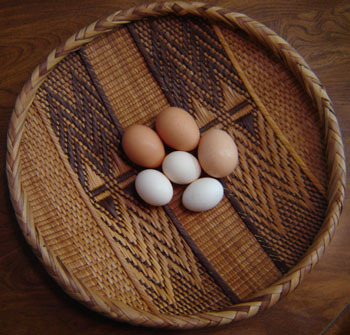 It is good to incubate eggs January through August when egg production is at its highest. However, for my Dominique chickens I sometimes have hatching eggs all year. 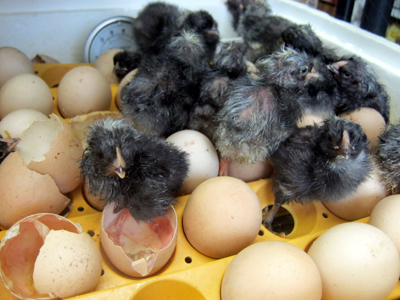 In terms of availability of hatching eggs, peak egg production is March, April and May. 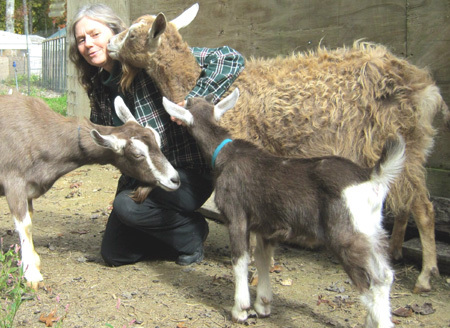 Good egg production is late January through July. 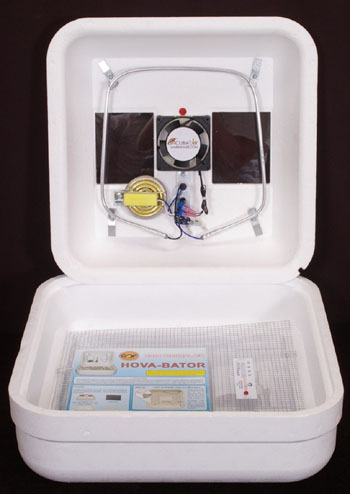 You can incubate poultry eggs in an incubator such as a HovaBator or Brinsea. Read the manual that came with it. Or you can build your own incubator. Or let a broody hen do it. 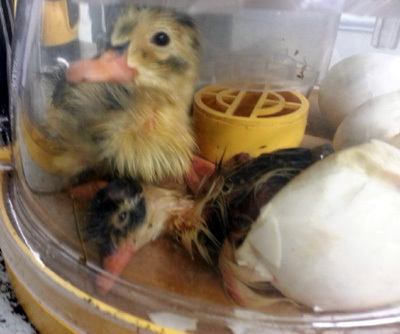 Frequently when people buy an incubator, they later wish they had bought a better (more expensive) one. It is best if the incubator is in a room with a stable temperature around 70-80 degrees. Do not let sun hit the incubator. 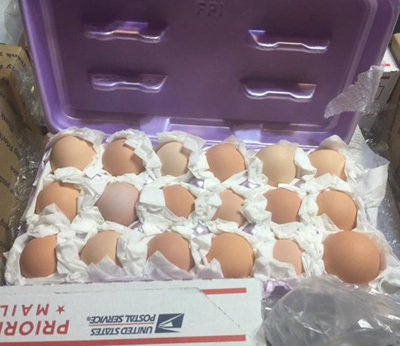 This photo is Dominique eggs that were shipped by me through the Post Office to Dolly and Richard in Mississippi. 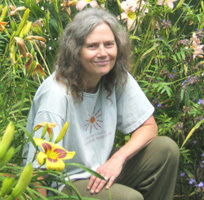 $9.90: Buy "A Guide to Better Hatching" Book By Janet Stromberg. 120 pages, 2012. Shipping is $2.95. Have great hatches. Before a fertile egg is incubated, the embryo inside is already developing. Collect eggs frequently. Clean lightly soiled eggs with a dry, soft cloth. 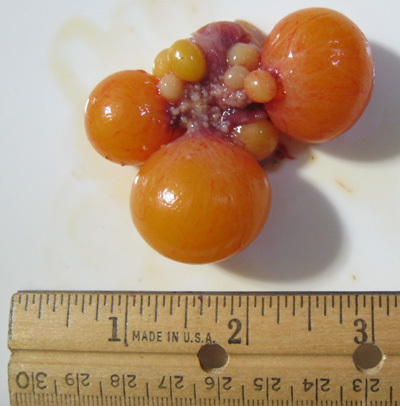 It is better not to wash them since they have a bloom that keeps bacteria out. But if you must wash them, use warm but not cold water. 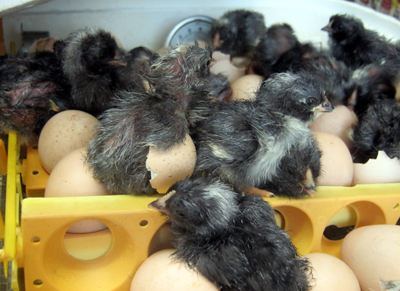 Do not incubate eggs that are very dirty because bacteria may have gotten into the egg. Handle gently. Do not put in refrigerator. Put them in an egg carton with the big end of the egg up. Then 2-3 times a day lift up one end of the carton, then the next time the other end. Do not turn upside down. Let eggs warm to room temperature before putting them in incubator. These photos are Cream Brabanter chicks. Chicken eggs are incubated at 99 to 99.5 degrees. 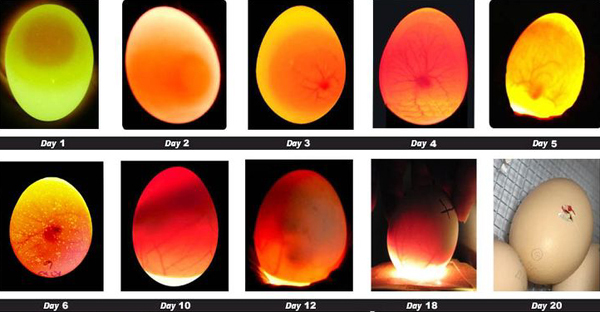 Chicken eggs incubate for 21 days. Your countdown for days starts when you put your eggs in your incubator. It does not start when the hen lays her eggs. 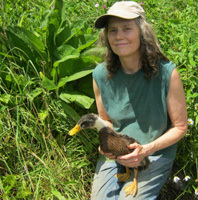 Duck eggs are incubated at 99 to 99.5 degrees. 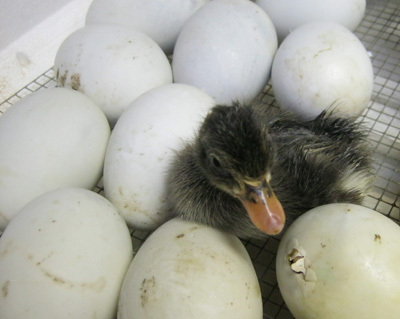 Mallard and domestic duck eggs (including Ancona) incubate for 28 days. 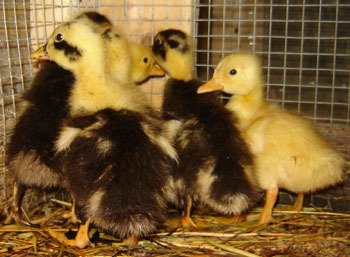 Muscovy duck eggs incubate for 35 days. You start counting your days when you put the eggs in your incubator. Turkey eggs incubate between 98-102 degrees with 99-100 degrees being best. Turkey eggs incubate for 28 days. About 2/3 the way through incubation, the babies in the eggs start generating some heat. 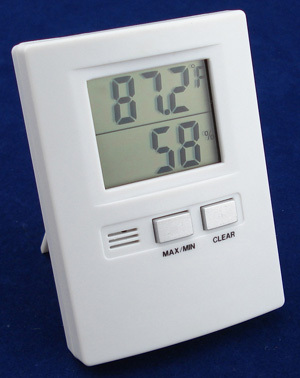 So you may need to turn the thermostat down if the temperature rises too much. Different humidities work in different incubators at different times of the year. It depends on your particular incubator, how humid the outside air is, and how porous these particular eggs are. Chicken eggs need 50-55% humidity for days 1-18, and 65-75% for days 19-21. Duck eggs like 55-65% humidity for days 1-24. From day 25 to first piping (ducklings start to crack egg, usually around day 28), humidity should be around 65-75%. When piping starts, increase humidity to 80-85%. Turkey eggs like 55-60% humidity for days 1-24. From day 25 to hatch, humidity should be around 75-80%. The photo to the left is a Hova-Bator. 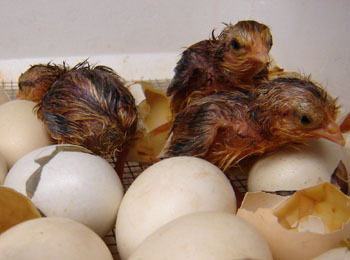 Different incubators hold different numbers of eggs. 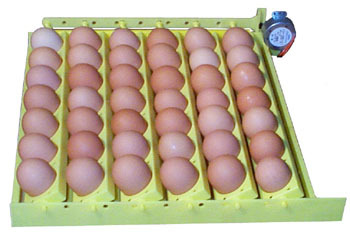 An "Octagon Incubator" holds 24 chicken eggs. 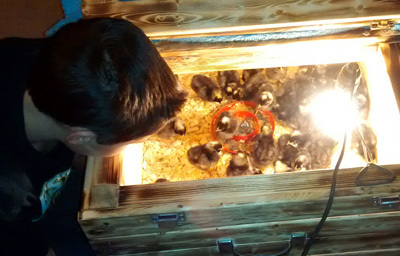 A "Little Giant Incubator" holds 30 chicken eggs. A "HovaBator Incubator" holds 42 chicken eggs. A "Farm Innovators Incubator" holds 48 eggs. You can use the same incubator for hatching chicken, duck or turkey eggs. Since the number of days of incubation is different, you hatch them so all eggs are the same type for each batch. 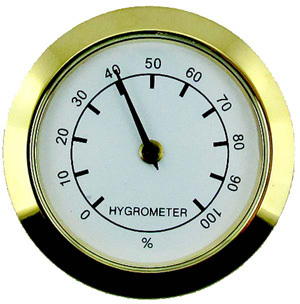 You need a hygrometer (humidity gauge). Keeping the right humidity is very important. 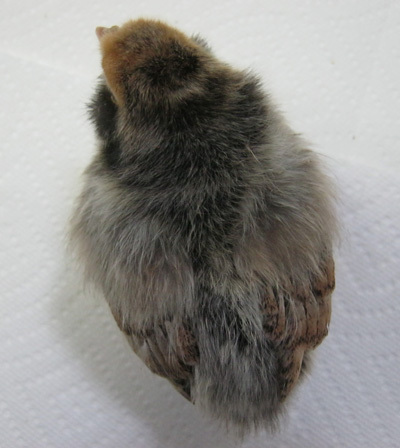 It is better to have higher than recommended humidity than lower especially when eggs are hatching. If it is too dry, the birds will have difficulty getting out of the egg. Open the incubator only when absolutely needed such as adding water to maintain humidity. Most incubators have small holes at the top where you can add water with a funnel. Water is usually added about 2 times per week. Check your humidity gauge. 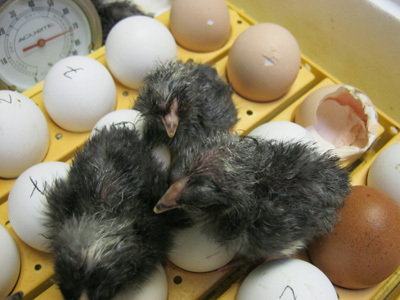 Opening the incubator changes the temperature and humidity that can take hours to readjust. It is best to have an electric turning rack. Eggs are put in the turner with small ends down. The turner moves very slowly. Or you can turn eggs by hand 3-4 times a day. Put a block/brick/book under one side of the incubator to make a 45 degree angle. Then switch sides, going back and forth each time. 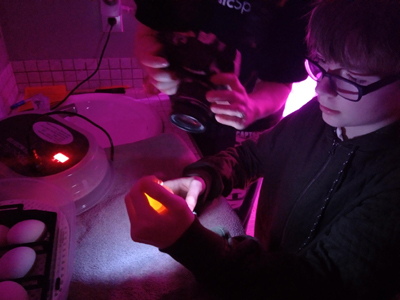 Turning prevents the embryo from sticking to the shell. Do not turn the last 3 days. Remove turner and put eggs on side on incubator floor. Or keep eggs in turner and turn off the electric when the racks are level. The advantage to keeping them in the racks is that the floor temperature is cooler than the rack temperature. So the egg temperature is kept stable. Also the babies in the eggs have adjusted to a certain position so not moving them may make it easier for them to get out of their shell. These 2 photos show hatches I have done both ways. There can be up to a 4 day difference between when the first baby hatches and the last one hatches. So let the incubator run more than 21 (chicken) or 28 (Ancona duck) days, just in case. YouTube Video of Ancona Duckling Hatching. The video is from Anya in Durham, North Carolina. It is great to watch the duckling get out of the shell. I was rooting for him. Fun to watch. Duck egg at 6 days from Jaime in Springfield, Vermont. 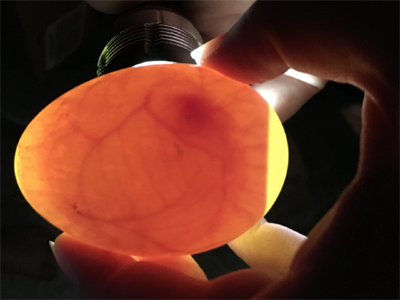 Duck egg at 7 days from Allison in Citrus Heights, California. Duck egg at 8 days. Duck eggs at 14 days from Joy in Bellevue, Washington. 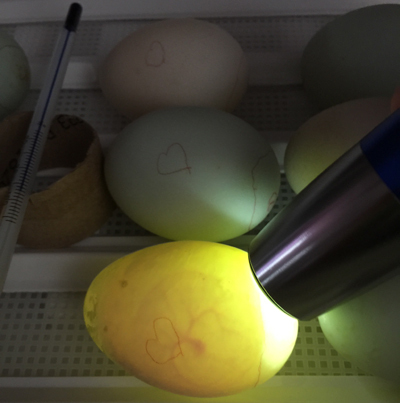 You can candle eggs which means looking at the eggs in the dark or in dim light with a flashlight touching the egg to see if the eggs are fertile and growing properly. You throw away infertile (clear) or dead (cloudy) eggs. You do not have to candle eggs at all if you don't want to. The less eggs are moved the better. 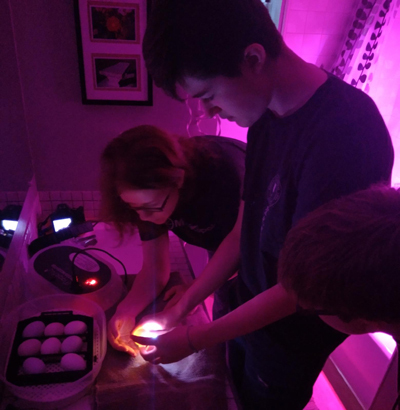 You can candle eggs at day 1 (when you receive your eggs) and after 7 days in the incubator. Candle again at day 14 or 18 if there were eggs that you were uncertain about. Otherwise, you do not need to candle again. The photo of the duck eggs with the hearts on them is from Shelly in Norman, Oklahoma. You can see the veins in the egg. 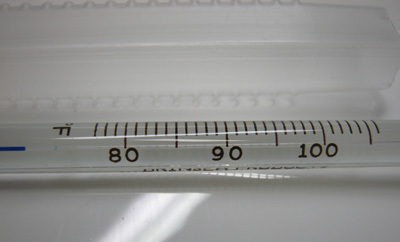 There is a Brinsea incubation thermometer in the photo. YouTube Video of candling eggs, 25 seconds. 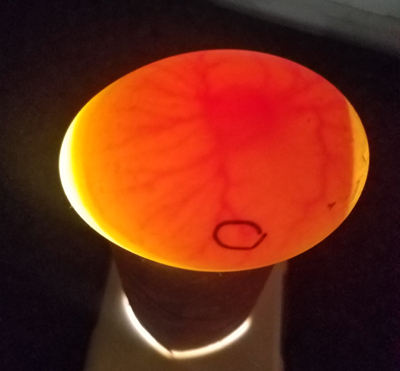 Here is an Ancona duck egg candling video from Eagle Flight Farm: YouTube Video of candling, 28 seconds. These 2 candling photos are from Joy. 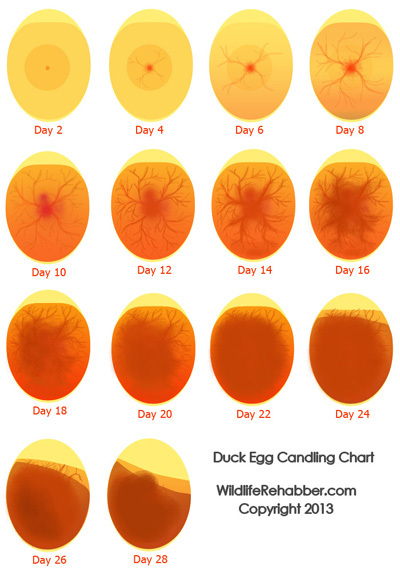 YouTube Video of candling duck eggs at 2 weeks, for 37 seconds from Joy. "All 8 fertile eggs look pretty much the same. Lots of veins, shadows, and some movement." Chicken egg that is not fertile. Below are chicken eggs. 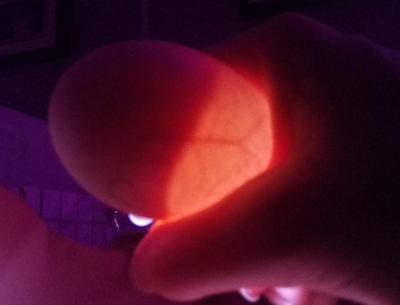 They hatch in 21 days. This is a photo of Dolly's Dominique chicks that Kevin hatched. Happiness for everyone. 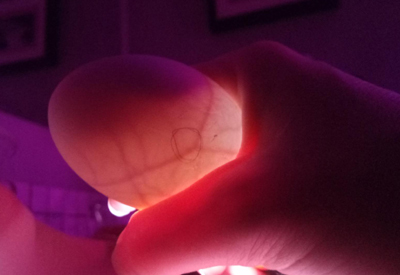 This unusual photo is from the inside of a hen. You can see how the yolk develops from tiny eggs, getting larger and larger going around in a circle. The yolk is produced by ovulation. The yolk is fertilized by sperm before the shell is added. The process is the same whether or not the egg is fertilized. You do not need a rooster for an egg to be laid. Though it can not grow into a chick. 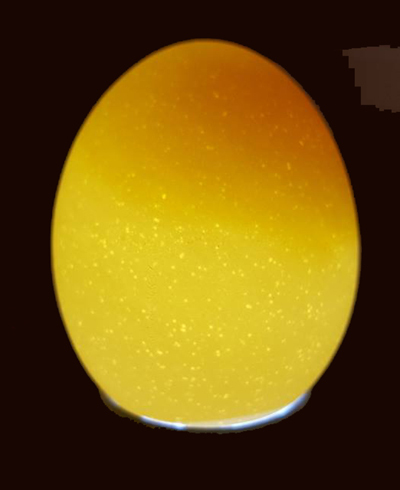 The eggshell, membrane, and white is added to the yolk as it moves down the oviduct of the hen. The oviduct is a long, spiral tube in the hen's reproductive system. The shell is made of calcium carbonate. The second photo is a perfectly formed egg. The photo is from Kelly in Raeford, North Carolina. This photo of Ancona ducklings was taken by Jason in New Martinsville, West Virginia. 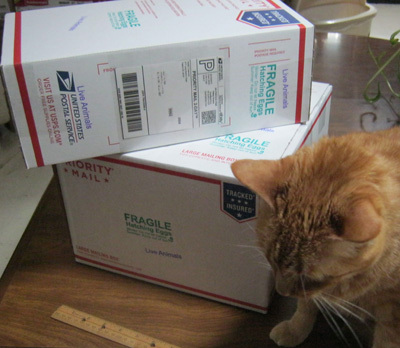 Boxes of hatching eggs ready to ship through the Post Office.